Great service and delicious food. They still serve a welcome plate and a fruit salad on the house. The housewine is tasty and the Cyprian beer is excellent. A good admosphere and nice staff. A recommedation. we are familiar with the Greek kitchen and this restaurant surely makes it to my top 3 favs. Just got home from the most amazing meal in a lovely restaurant. A friend recommended it I was in town so I thought I would give it a go, kolossi is the name there serve great Greek food at very reasonable prices, found the staff to be very accomodating and friendly.i will be back for sure. 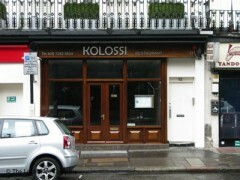 My wife and I went to the Kolossi Grill on the evening of Wednesday July 21st. We were greeted by a scruffily dressed young man who held up two fingers in the manner of a V sign, then showed us to a table without speaking before bringing menus. Giving us very little time to choose our dishes, he returned and interrupted our discussion witout apology, asking "what do you want?" Altogether, he was very surly and rude, not at all what you'd expect in a waiter. After placing our food order and ordering drinks we waited ... and waited. Eventually our first course arrived, with my wife's order being completely wrong. Her plate was taken away without apology, and again we waited ....I had almost finished my food before hers arrived, and STILL no drinks, which we had to ask for again. These were brought, again without apology. Our dessert order was brought by a pleasant and smartly dressed young lady, who had the grace to apologise for the totally liquid "ice cream" which formed part of the dessert. We asked for the bill, and 15 minutes later we had to ask again! When it eventually arrived it had been added incorrectly to the tune of £3.00, which then had 10% 'service charge' added. Again, no apoplogies were tendered for the mistake. The one saving grace was that the food was acceptable, althoug nothing to rave about. Altogether, a dining experience which we certainly won't be repeating, and we urge others to find somewhere else to eat! We thought it would be a good idea to have our New Years Eve-dinner at Kolossi while we where staying in a hotel nearby, we like greek food and we where a company of nine. Quite moderate prices, you must say. But that´s also the only thing. The service was absolutely the worst I ever have experienced, Manual and Basil in Fawlty Towers would be considered as stars compared to this, and the food served was really nothing to right home about. I do not recommend it! The service and food quality in this restaurant was not very good. When ordering, the waiter heavily pushed four times(!) to get me to try and order the 3 most expensive dishes on the menu even though I kept mentioning I wasn't interested in them. This got to the point where it became embarassing. The quality of the dish I did order (a lamb shish) was probably the toughest and fattest meat I have tasted in a long while. This dish was excellent for giving your jaw a good work out! You could easily get a better quality of this dish in a local kebab house. My wife, however, had a vegetarian moussaka which she found to be average but ok. Unfortunately the rudeness of the waiter continued when paying the bill. Whilst paying the bill via my card he actually pushed the tipping tray twice on the table(!) and said "arent you going to leave a tip!" (A 10% service charge was already added to the bill). Needless to say I thought the 10% was more than generous nevermind a further tip! I feel this restaurant is only in business due to its proximity to the various hotels in the area cashing in on visitors, as a local, I wont be returning or recommending. P.s I eat out on average once a week in London and this is the first time I have left a restaurant and thought I have needed to post a review like this when I returned home. Sorry, this just wasn't very good.